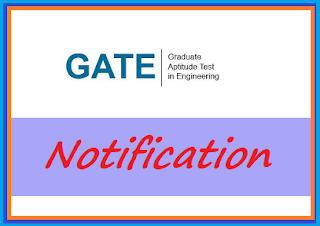 GATE 2019 Notification is now available on this web page. The interested candidates who are willing to apply for GATE 2019 Exam should submit the application form before the last date given on the official GATE 2019 Notification. Indian Institute of Technology, Madras will conduct the examination of GATE 2019 in the February month for 24 papers via online mode. Recently, the exam authority announced a new paper “Statistics” which is added from this year. GATE 2019 is a national level engineering exam for admission in post-graduation courses in IITs, IISc, NITs, GFTIs and other institution across India. The GATE exam conducted every year jointly by the IISc, Bangalore and Seven IITs on behalf of the National Coordination Board(NCB) – GATE. The candidates who are excited for the GATE 2019 will able to select only one GATE paper for the examination. The scorecard of GATE Exam will be valid up to three years after the examination for M.Tech admissions. Also, the various PSUs have their eye on the topper of the GATE examination and most of the time they will hire the GATE, qualified candidates. The official GATE 2019 Notification has already released on the official web portal on 6th July 2018. The application form submission process will start from 1st September 2018. The GATE examination will be conducted in 200 cities in the India and Six cities of abroad are selected for the exam. But before you apply the application for the GATE 2019, you should check out the official GATE 2019 Notification available on this web page. To get the notification of GATE 2019, you can go through the link given on this web page. The candidates who are willing to apply for the GATE 2019 should go through the eligibility conditions of the exam. The candidates who meet the eligibility conditions of the exam may proceed to apply the GATE 2019 application form without any delay. Also, don’t forget to check the GATE 2019 Notification available online. The aspirants should have passed completed or pursuing their Bachelor’s Degree in Engineering/ Technology (B.E./ B.Tech) or M.Sc. with the relevant science subject can apply for the GATE 2019 Exam. There is no age limit introduced by the exam authority. The candidates should have the nationality of India, Bangladesh, Nepal, Sri Lanka, Ethiopia, Singapore, and UAE will eligible for the GATE 2019. Note: - There is no minimum required pass percentage in the qualifying degree. Integrated M.Sc./ Integrated B.S. – M.S. Thanks for visiting here. Leave a comment about your doubts. Have a Nice Day!